Observations of harmful algal blooms (HABs) and algal toxins have increased globally in recent years. HABs are problematic because they can affect multiple beneficial uses including recreation, aquatic life, and drinking water by reducing aesthetics, lowering dissolved oxygen concentration, causing taste and odor problems, and producing potent toxins. See an algae bloom? Click here to report it! Water Board staff are working with state and local entities to identify and respond to HAB incidents throughout California. The Water Board first began to formally address this issue in 2005 when it formed the Blue Green Algae Work Group, later renamed the California Cyanobacteria Harmful Algal Bloom Network (CCHAB). An initial product of this group was the Voluntary Guidance Document (original release 2010, updated 2016). 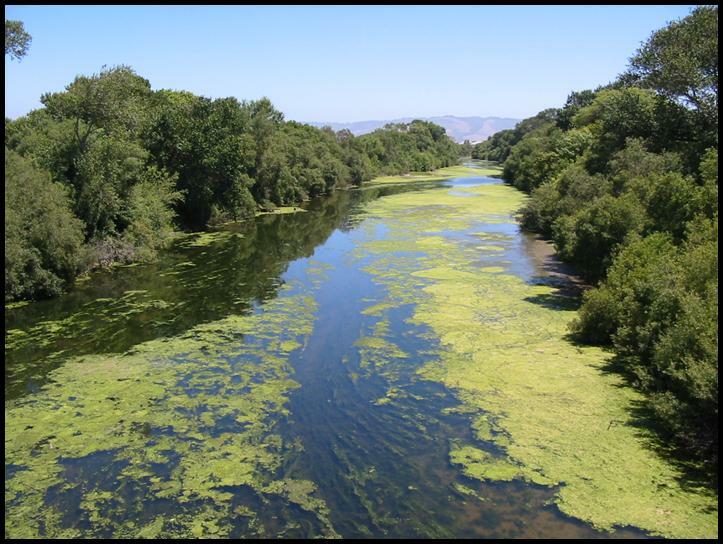 Subsequently, SWAMP prepared California Freshwater HAB Assessment and Support Strategy to articulate a coordinated program to assess, communicate and manage HABs in California. Since then staff at both the State and Regional Water Boards have worked to coordinate monitoring and follow up when algal blooms are detected. SWAMP has also developed the infrastructure (bloom reporting form, guidance documents, field and lab procedures, etc.) to support the strategy and to coordinate monitoring when blooms are detected.